At 17 years old, most teenagers are more concerned with exams & partying than preparing themselves for a fruitful music career. Japanese Wallpaper, aka Gab Strum is not your typical teenager. His debut single ‘Breathe In Ft. Wafia’ released by Zero Through Nine in 2013 saw the Melbourne wunderkind rack up over 300,000 plays on Soundbutt, a feature in Zach Braff’s follow up movie to Garden State, Wish I Was Here and closed the final moments of popular drama series, Offspring. The latest single ‘Between Friends ft. Jesse Davidson’ was unleashed after winning the 2014 Triple J unearthed competition. The track quickly received over 100,000 plays in on Soundbutt, high rotation on Triple J, and led to three sold out Melbourne show launches. 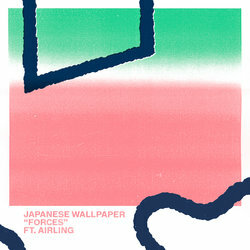 Having supported the likes of Sohn and The Kite String Tangle and receiving praise from Gotye, Chet Faker, and Bombay Bicycle Club, it’s often forgotten that Japanese Wallpaper is so young. Japanese Wallpaper's latest collaboration is his most auspicious yet. Featuring ethereal Airling on vocals, “Forces” pulses with intensity, and Strum says it's the first time he and a collaborator had nothing prepared. Instead, they worked from scratch together, and three days later they'd written their next single.